Book now and let your guests experience the restaurant that has DC buzzing. From dinner parties to weddings, bar mitzvahs to baby showers, our events and catering team can orchestrate private events at Sfoglina — Downtown or Van Ness, in your home, or in the venue of your choice. Regardless of the occasion, scale or nature of your event, our event team will work closely with you — from food and decor to staffing and budget — to customize an experience that exceeds your expectations. Our goal is your ultimate satisfaction and an event you'll remember for a lifetime. Please use the form below to contact us about our private events or catering services. Please contact Kristen Dennis, Private Events Manager, at (202) 264-9497 or email sfoglinaevents@fabiotrabocchi.com for more information. The Dino Room is “front and center” Sfoglina, adjacent to the beautifully appointed Bar. Cozy and intimate, the Dino Room is named for Maria’s brother. The Dino Room is ideal for a happy hour, small business dinner, or family party. Floor to ceiling windows provide incredible natural light and a view of a lively 11th Street in our Lina Room, named for Fabio’s aunt. The shades can also be drawn for privacy. The Lina Room features a separate entrance for your exclusive event. Perfect space for a small cocktail reception, business, or celebration dinner. With a view of all the action in the kitchen, the Peppe Room or “Chef’s Table” is named for Fabio’s father, Giuseppe “Peppe” Trabocchi, who inspired his love of food and cooking. The Peppe Room is equipped with its own television, and is ideal for lively family gatherings, business lunches, or dinners. Named for Fabio’s Maternal Grandmother, Palmina, this room is the physical and “spiritual” heart of the restaurant. 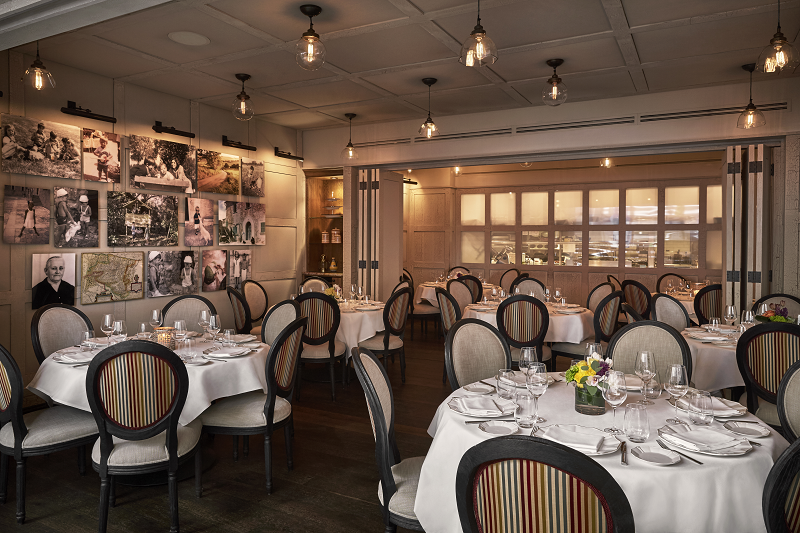 Decorated with Trabocchi family photos, the Palmina Room is both elegant and comfortable, suitable for informal gatherings as well as business lunches and dinners. We can combine two of the private rooms or open all three spaces to accommodate your larger events, offering the beautiful natural light and private entrance of the Lina Room, the charm and elegance of the Palmina Room, and the lively ambiance of the Peppe Room. During the warmer months, host your next office get-together or celebration while overlooking the gorgeous DC skyline. Exclusive use of the restaurant can be arranged for breakfast, lunch, and dinner events any day of the week; with our Dino Room and Bar as the perfect setting for a pre-event reception. Our option for dining “all’aperto” in the warmer months, the well-appointed Downtown Patio has vibrant orange canopies, stunning marble tables, and tasteful landscaping. It's the perfect setting to “see and be seen” for your next work happy hour. The Claudia Room exudes vintage Italian charm with cozy loveseats and '60s Italian record covers.